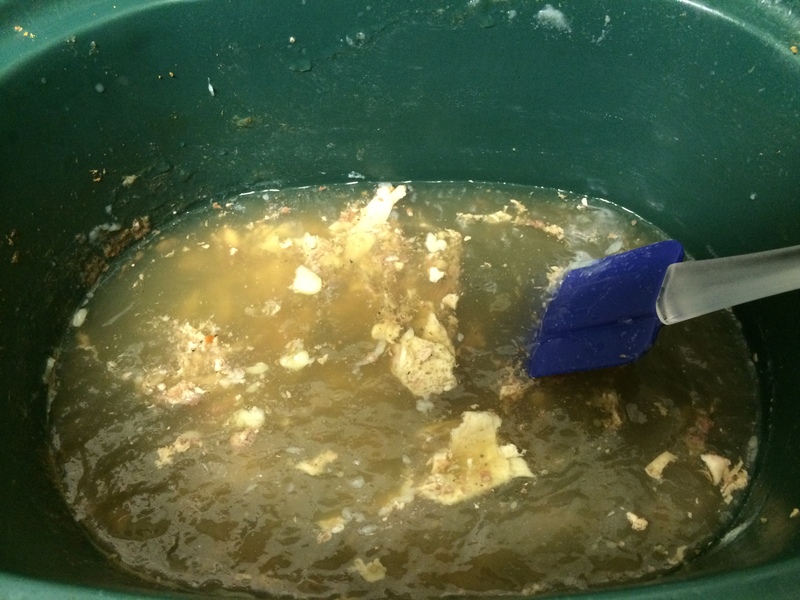 Broth vs Stock – There is a difference! But I learned that broth is what I make – the juices that the chicken is cooked in, seasonings, and vegetables. However, stock is from the bones, vegetables, and some meat – furthered boiled down! Stock offers a much richer, bolder taste that really enhances recipes like chicken or beef noodle soup! Additionally, there are several reported benefits to drinking it by itself if you are ill or not feeling well, as it contains numerous nutritional advantages. In doing more research online, it can be a little confusing as people tend to use these words interchangeably, and their definitions vary a little. This website and this one do a great job of further explaining the difference. I found a few recipes and guidelines if you are interested in making your own. Chicken stock recipe here and here. Beef stock recipe here and here. You can also make turkey, fish, or vegetable stocks. I love the rich color of the stock! This has inspired me to take my bones to the next level and to make some stock! Chicken stock. Photo source: Elana’s pantry. Beef stock. Photo Source: Simply Recipes. Have you ever made stock? Do you notice a big flavor difference between stock and broth? I love my crock-pot! It is so easy to throw something into it in the morning and come home at night to a near ready meal! It sure makes dinner a breeze. Plus the leftovers are great for lunch the following day. 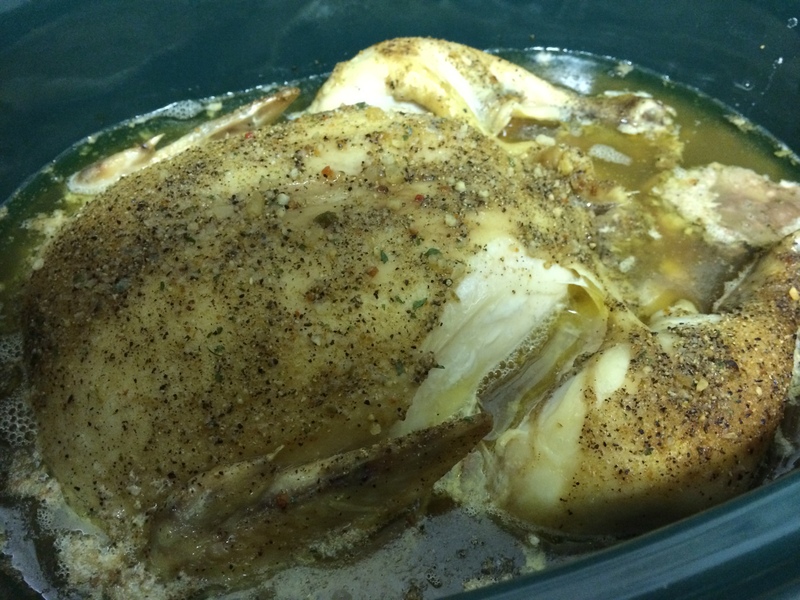 One of the easiest (and most economical) things I do is throw a whole chicken into the crock-pot. I will share with you how I can turn a chicken into several meals and freeze my own chicken broth! I showed how to turn a pork loin in several meals here. 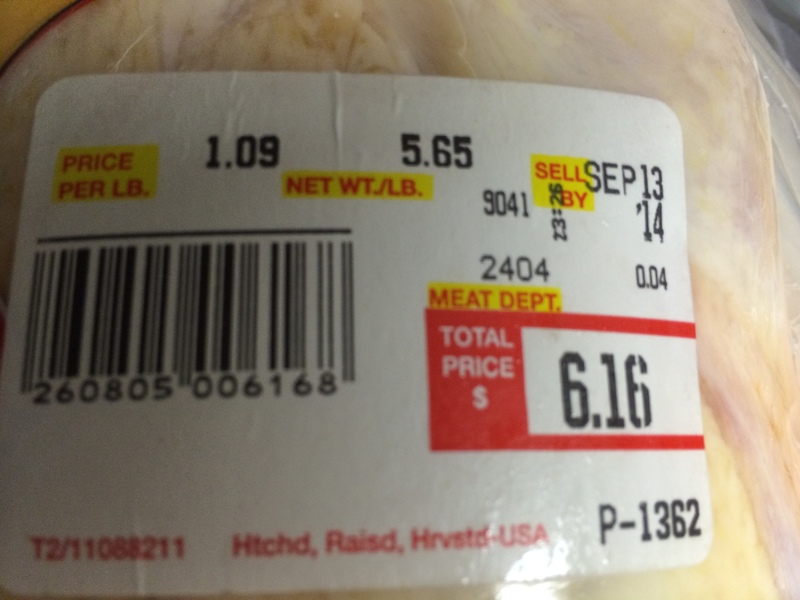 I bought a 5.65 pound roaster chicken at the store for $6.16. I put the thawed chicken in the crock-pot, added 1 cup of water (you can add more if you want more broth), and a few seasonings (garlic salt, pepper, and a little chili powder). If you remove the skin, the seasonings really don’t matter, except for flavoring your broth. For more meat handling, thawing, freezing, and safety tips visit here. 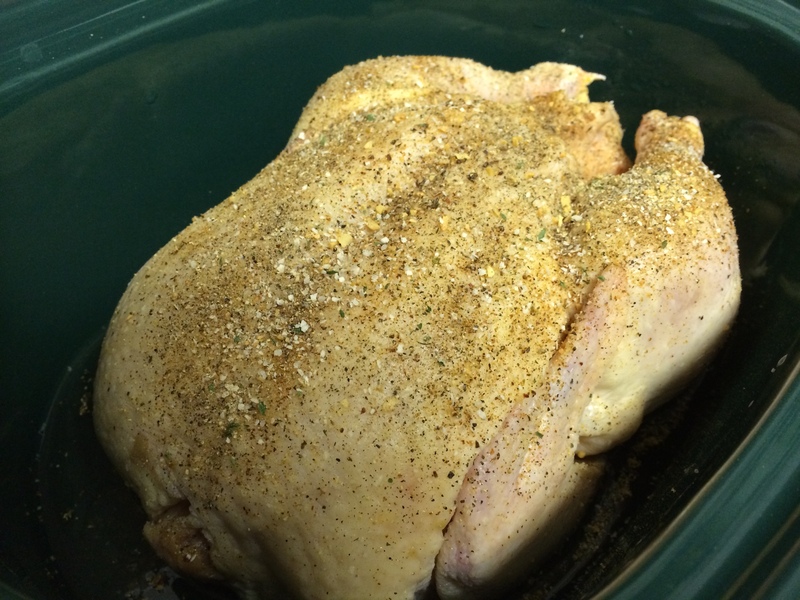 The chicken is ready – with water and seasonings. I usually cook this on low all day (~7-8 hours) because I start it when I leave my house in the morning and pull it out when I get home in the evening. You can cook it for less time, but this is what works for me. Also, cooking one overnight to be ready in the morning works really well too! To determine that it is fully cooked, you can insert a thermometer. I do the “leg-check” if one of the drumsticks easily pulls away or falls off the rest of the bird, then it is done. 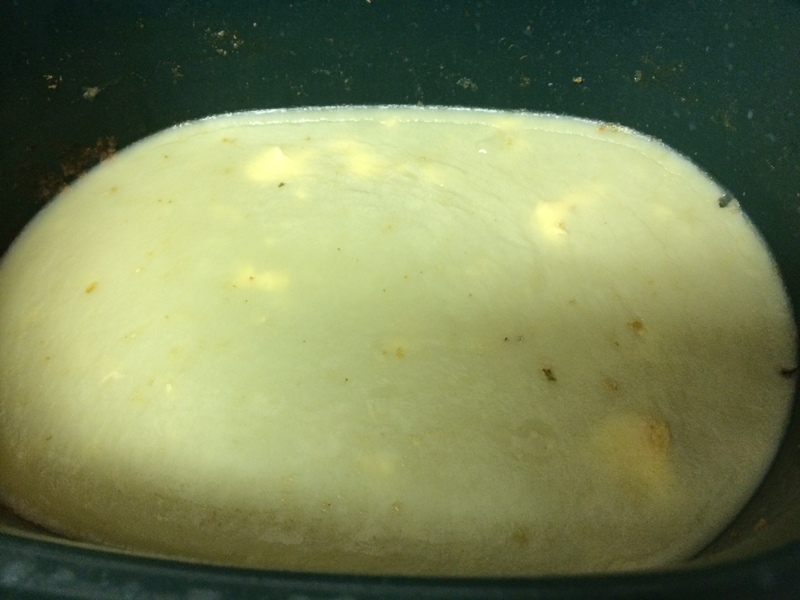 When it is fully cooked, pull it out of the crock-pot and out of the juices to let it cool. Do not try to shred it until it cools, it will burn your hands! Once it is cool enough to handle, I separate all of the meat from the bone and fat (which I just throw away). A bunch of shredded chicken. 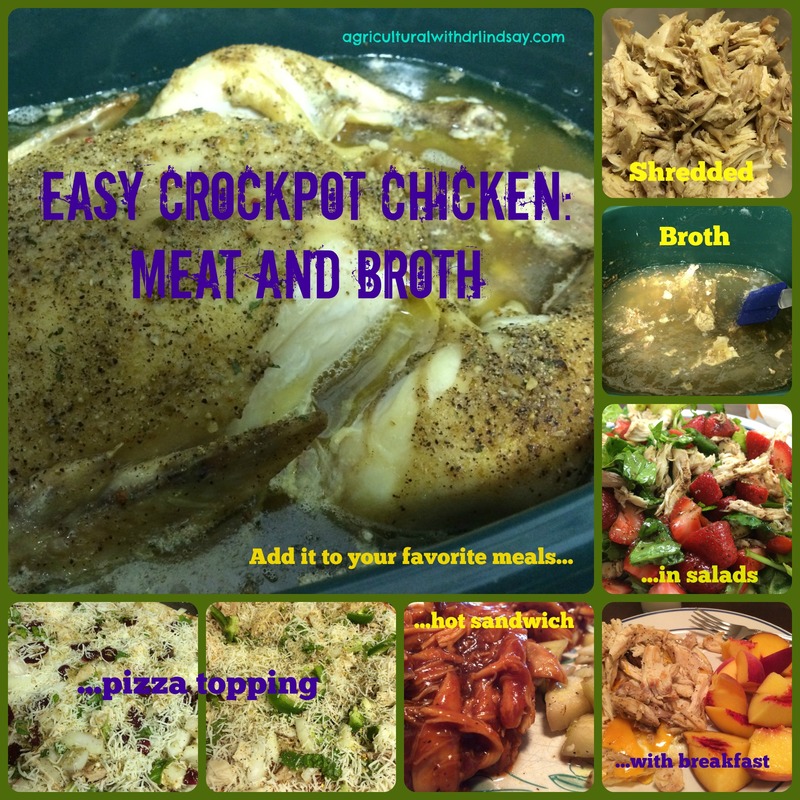 I use the chicken for various meals during the week, it is very convenient and easy to re-purpose into a meal – or you can eat it fresh out of the crock-pot! The hubs and I were able to use the 5.65 pound chicken in EIGHT different meals ! We used it as a topping for 2 pizzas, we made pulled chicken BBQ sandwiches, I included it in a morning breakfast, and I added it to a salad! That is $0.77 per serving for meat protein! Let’s talk about chicken broth. Ever since I have started doing the crock-pot chickens I have been saving the broth (aka the juices it cooks in) from it. I do this when I make beef roasts too! This way I know there are no preservatives and it is low sodium – as I season it myself. Keeping the broth is easy. I put the crock-pot in my fridge overnight (the freezer for a shorter time works well too if you don’t have room in your fridge). It just needs to be long enough to make the fat solidify on the top so you can scrap it off. Gently use a spatula to scrap off the thin layer of fat. I put it in an old plastic container to be thrown away. Once you get your chicken out you will see chucks of “stuff”. 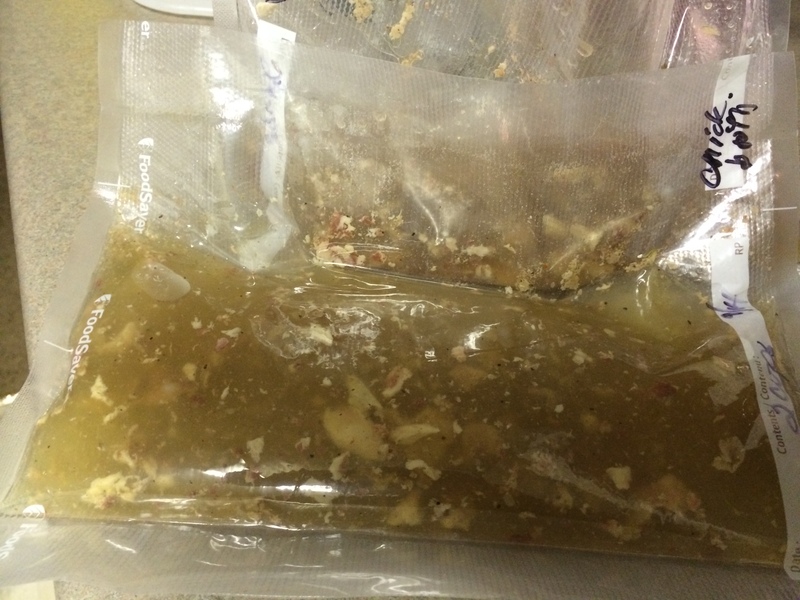 This stuff is the liquid protein (juices) that came out of the chicken while cooking – it is good for you. So leave it in there, just make sure no bones were left behind. And you are left with the broth. After I scrape the fat off I stir the broth up just to get anything that settled to the bottom, so when I portion it out there is an even distribution of flavors. Portion it up, I usually do 2-4 cups per bag, as that is what most of the recipes I make call for. 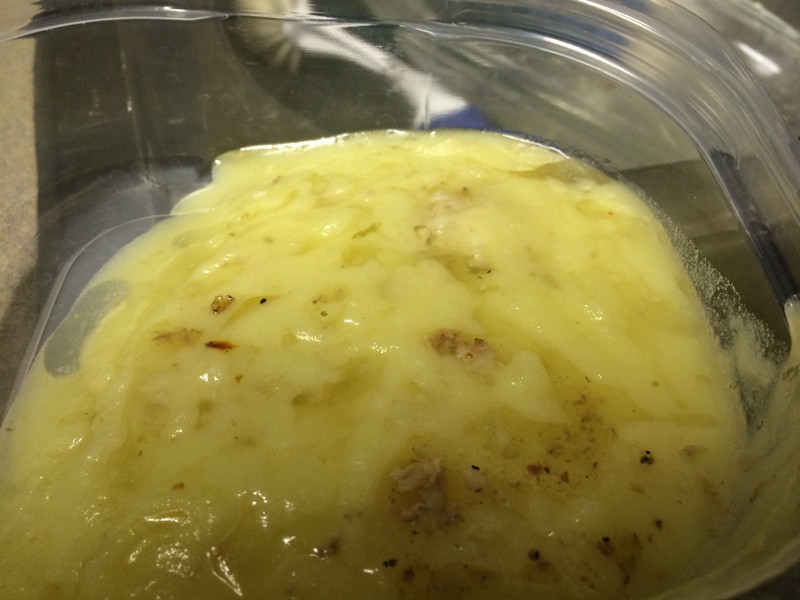 Be sure and use an airtight container so it doesn’t freezer burn (unless you plan to use it quickly). Label it! Include the date, what it is, and the amount. It sure makes it easier when you use it in later recipes. 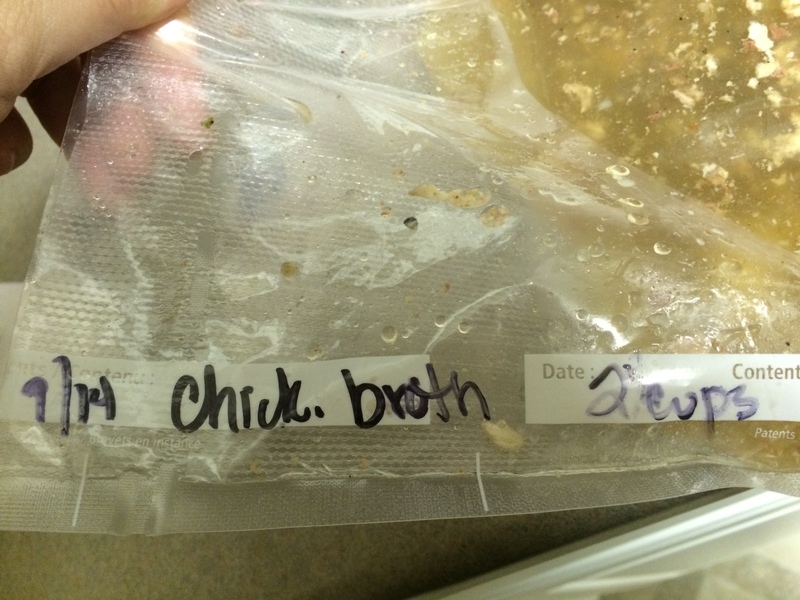 By cooking several crock-pot chickens a year, I am able to provide us with enough broth that I rarely have to buy any. And with fall quickly approaching, my freezer is stocked with chicken broth for our favorite soups and stews. 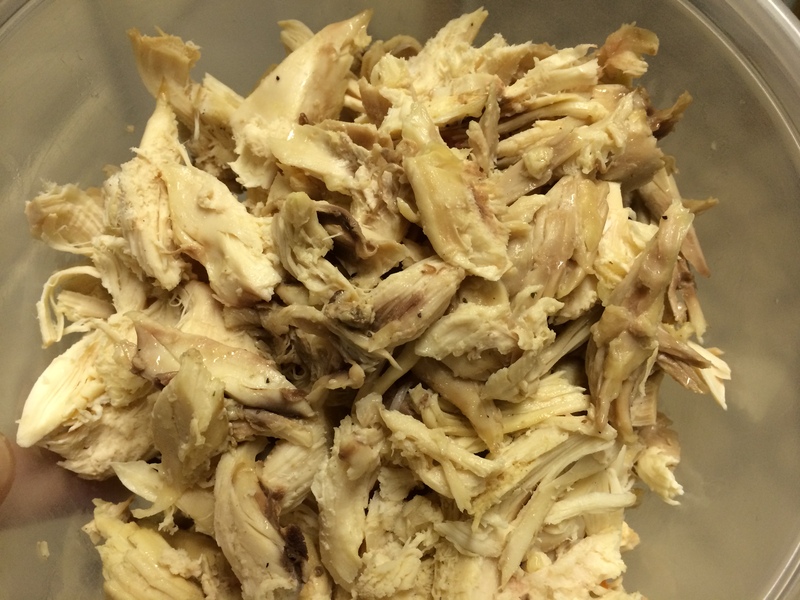 What other ways have you used shredded chicken? Do you save your own broth?